PVDM3-256 - 256-channel high-density voice and video DSP module. 256-channel high-density voice and video DSP module. Cisco PVDM3-256. Network Hardware Depot. Juniper SCBE-MX-S. Can't find what you're looking for?. Unsure if this is what you need?. Original Cisco Systems EHWIC-VA-DSL-A ADSL2/2 & VDSL2 WAN Interface Module ( Refurbished). Single (1x) ADSL2/2 & VDSL2 over PoTS WAN interface. Modulo Cisco Systems EHWIC-VA-DSL-A ADSL2/2 & VDSL2 WAN Interface (Ricondizionato). Cisco CCNA CCNP CCIE Voice Video and Collaboration. 4x Cisco PVDM2-64. 4x Cisco PVDM2-64 Voice/Fax DSP Module. 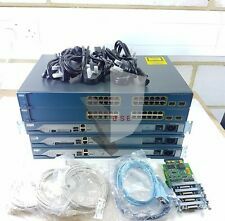 4x Cisco PVDM2-64 Only. This Sale is for. CISCO CCNA CCNP LAB KIT 2811 ROUTER 3560 SWITCH LATEST IOS 15. 3x CISCO2811 - LATEST IOS 15.0 2x WS-C3560-24TS-S 4x WIC-1T. CISCO LAB KIT. The service is currently available only for The City of London & Canary Wharf. 12 Months Warranty. The price is £30. We will try to respond to all inquiries within 2 hours. Cisco EHWIC-VA-DSL-A. For your Enterprise Network or Cisco CCNA CCNP CCIE. 1x Cisco EHWIC-VA-DSL-A. CISCO CCNA CCNP LAB KIT 1841 ROUTER 3560 LAYER 3 SWITCH LATEST IOS 15. 3x CISCO1841 - LATEST IOS 15.0 3x WS-C3560-48TS-S LAYER 3 SWITCH 4x WIC-1T. CISCO LAB KIT. The service is currently available only for The City of London & Canary Wharf. 12 Months Warranty. The price is £30. Practical applications of 4G LTE for distributed enterprises such as parallel networks, primary connection, failover, in-vehicle, network convergence, and wireless WAN diversity. The 4G LTE EHWICs with ISR G2 is the industry leader to bring enterprise grade wireline like functionality such as Quality of Service (QoS) for cellular, Multi-VRF for cellular and Unified Communications solutions over LTE.". For VS-S2T-10G VS-S2T-10G-XL Upgrade from Default 2Gb to 4Gb. NM-16A - 16 port Asynchronous Module. 16 port Asynchronous Module. 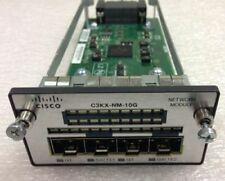 Cisco NM-16A. Network Hardware Depot. VIC2-4FXO - Four-port Voice Interface Card - FXO. Four-port Voice Interface Card - FXO. Cisco VIC2-4FXO. Model Number. Can't find what you're looking for?. Unsure if this is what you need?. Any hard drives (if included) have been data wiped and work. We are able to source hard to find parts for Legacy systems through to the latest new in box parts for the latest generations of servers & storage systems. Cisco 7916 IP Phone (CP-7916). 1x Cisco 7916. CCNA CCNP CCIE Voice and Collaboration. (IP Phone Expansion Module). Juniper 1-Port Gigabit SFP Enhanced PIM Module. It begins with products such as Juniper Netscreens, base systems, interfaces and components. New open box condition. Interactive Voice Response Module Type: AIM. TEST REPORT. Module Serial: FOC09103QPK. Disk Drive: 1GB. SHOW VERSION. SHOW SOFTWARE VERSION. AIM-CUE# show software versions. Local pick up is available and always free. IEEE 802.11 A/B/G Access Point HWIC. ONE (1) HWIC-AP-AG-A Module. We do our best to test and describe every item honestly. $Item Description: C3KX-NM-10G ---Catalyst 3K-X 10G Network Module ---Two 10GbE SFP ports network module with 4 physical ports ---2 SFP and 2 regular SFP ports In The Box: ---C3KX-NM-10G. However you find us, you will know you have the backing of our warranty. Cisco HWIC-4ESW. 1x Cisco HWIC-4ESW. This Sale is for. No we do not mark as gift. Here we have a Cisco HWIC 4t 4 port wan Interface. This is a working pull I very nice condition. (1) Occam 6322-01 GPON OLT blade - tested with warranty!! Test report provided with each blade! Repair prices will vary depending on the type of blade and the reported issues. Calix B6 Blades. 2-port Ethernet HWIC. Cisco HWIC-2FE Overview. Ethernet Technology: Fast Ethernet. Cisco 1841, 1841 2-pair, 1841 4-pair, 1841 T1, 1921, 1921 4-pair, 1921 ADSL2 , 1941, 2801, 2801 V3PN, 2811, 2811 V3PN, 2821, 2821 V3PN, 2851, 2851 V3PN, 2901, 2911, 2921, 2951, 3825, 3825 V3PN, 3845, 3845 V3PN, 3925, 3925E, 3945, 3945E. This data sheet contains the specifications for the Cisco 1-Port 10 Gigabit Ethernet Shared Port Adapter. (1-Port Serial High-Speed WAN Interface Card). Cisco HWIC-1T. 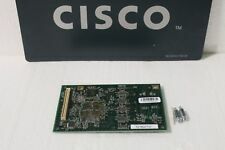 1x Cisco HWIC-1T card. Ideal for your Enterprise Network. 1x C3K-PWR-750WAC. 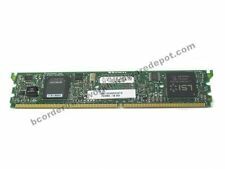 You are buying on a Genuine Cisco HWIC-2FE High Speed WAN Interface Card. card only. Pictures shown above are original pictures. Feed Back Policy. This information is. SPA-8XCHT1/E1 - 8-port Channelized T1/E1 to DS0 Shared Port Adapter. 8-port Channelized T1/E1 to DS0 Shared Port Adapter. Cisco SPA-8XCHT1/E1. Can't find what you're looking for?. Unsure if this is what you need?. "Warranty" – (not valid if item has been, in any form, tampered with). Any modifications and/or alterations will VOID the warranty. If either of these are missing or if the seals have been tampered with the warranty is void. Genuine Cisco. Hologram and Serial Intact. We will provide you RMA#. We list them honestly and we list how it was tested. Alcatel-Lucent 7210 SAS-M Service Access Switch 24-SFP 2XFP ETR. Pulled from working environment and tested good. 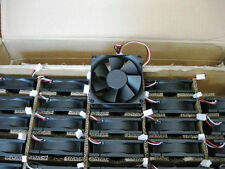 Includes 2x -48v DC power supplies, 1 fan tray, and 2 mounting brackets. Actual units may differ from those pictured. The units are in good used condition, may have some scratches or small dents from installation and removal. The Cisco Gigabit Ethernet EHWICs have either four or eight 10/100/1000 switched Gigabit Ethernet ports, with options for PoE support on all ports. The cards provide line-rate Layer 2 switching across the Gigabit Ethernet ports, using Cisco IOS Software embedded in Cisco Catalyst switches. Model Number :Cisco HWIC-2T. Cisco HWIC-2t. Quantity Available: Two(2). Quantity: ONE (1). It may be a different version such as : version 01, 02,03,04,05 and so on. 1 piece of. The Cisco SM-X Layer2/3 EtherSwitch Modules are an enterprise class line of switches in Cisco ISR extended service module form factor for the Cisco 2900 and 3900 Series and Cisco 4451-X ISRs. CISCO CCNA CCNP LAB KIT 2801 ROUTER 3560 POE SWITCH LAYER 3 LATEST IOS 15. 3x CISCO2801 - LATEST IOS 15.0 2x WS-C3560-24TS-S 3x WIC-1T. The service is currently available only for The City of London & Canary Wharf. 12 Months Warranty. The price is £30. We will try to respond to all inquiries within 2 hours. Tested for Key Functions, R2/Ready for Resale. Defective or Not Described. Then we will. Wrong size doesn't fit. Or it doesn't fit your application and is marked No longer want the item. Cisco 881G-K9 with power cube. This new module is a single-wide, single-port universal T3/E3 service module with integrated channel service unit/data service unit (CSU/DSU) and provides clear-channel and subrate T3/E3 connectivity. Data Link Protocol8Gb Fibre Channel. LabelN5K-M1060 Nexus 5500 8 Port Expansion Module. Designed ForCisco Nexus 5010, 5010 Solutions Kit 8G FC Unified Fabric, 5020, 5020 Solutions Kit 8G FC Unified Fabric. Item in Picture is for advertising purposes only. Serial number and Version ID may be different than what is in the pictures. We will provide you RMA#. We list them honestly and we list how it was tested. 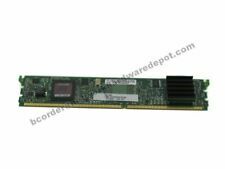 Cisco C3KX-PWR-440WDC Used 245. Network Module. Access Point. Power Supplie. Line Card / Supervisor. DEFECTIVE?. RECEIVED WRONG ITEM?. We always strive for FIVE-STAR service in every category that you can rate us on.